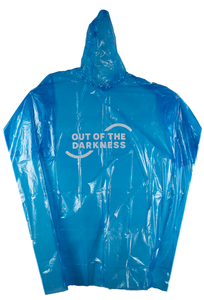 The sun will come out tomorrow…but when the skies open up for an unexpected rain shower, this Out of the Darkness Rain Poncho will keep you dry while letting everyone else out in the storm know that you support AFSP and suicide prevention. P.S. : it’s light and pocket-sized when folded up, making it perfect to bring along on your next Out of the Darkness Walk.